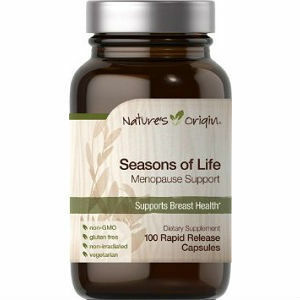 Seasons of life is an all natural herbal supplement designed to help relieve some of the many discomforts that are commonly associated with menopause. It is indicated for the relief of hot flashes, moodiness and cramping. As the new supplement on the block we decided it was time to research Seasons of life. This is what we found. Vitex Chasteberry- Chasteberry shows insufficient evidence for helping with Menopause symptoms. The recommended dosage for Seasons of Life is 2 capsules twice each day. You should take it with a full glass of water and a meal. The price of one bottle of Seasons of Life is $12.99. Each bottle of Seasons of Life contains 100 capsules. Seasons of Life comes with a year long money back guarantee. However, they will only refund the purchase price, not shipping, or return shipping. This means that if you do happen to return it, it is not worth returning it, you will get $12.99 back, if you pay $5 on shipping to get it, and then pay 5$ on shipping to return it, that means that you will not even make all of your money back, you will actually lose money. Seasons of Life contains ingredients that are helpful and good for the body, however not all of the ingredients are clinically proven to be effective for the relief of the many discomforts brought on by menopause. Jackie Horowitz	reviewed Seasons Of Life	on April 13th	 and gave it a rating of 2.